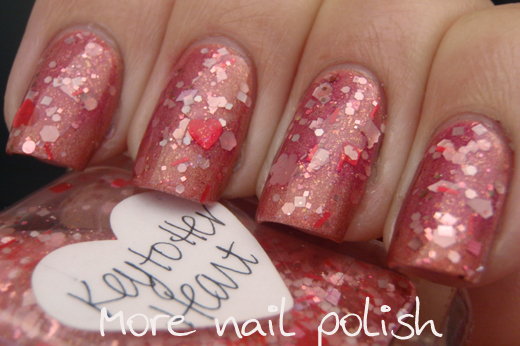 Over the next week or two I'm hoping to show some polishes from the latest Lynnderella collection Groundhog Day. I'm pretty excited to have received these so quickly after they were launched. It just so happened that I finally sorted out getting the Christmas collection (through wonderful mule friends) and these were released just a day later. I'll eventually get around to showing the Christmas Glitterings polishes one day too. Key to Her Heart has an slight coral pink appearance overall. I'm not going to go into the details of the mix of regular glitters, I'll just mention the special ones. There are pale pink and darker pink hearts and pale pink flowers, butterflies, diamonds and dots. 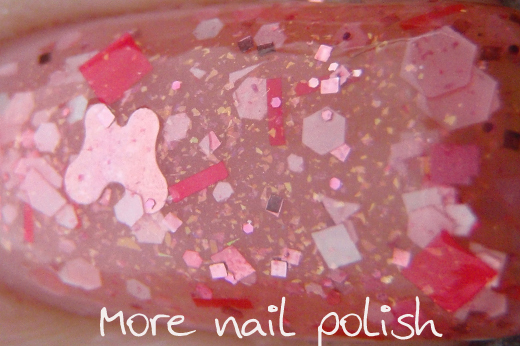 There is a mix of shiny, matte and satin finish glitters and the base has a golden micro glass fleck. This polish has so much more going on it than I originally realised. 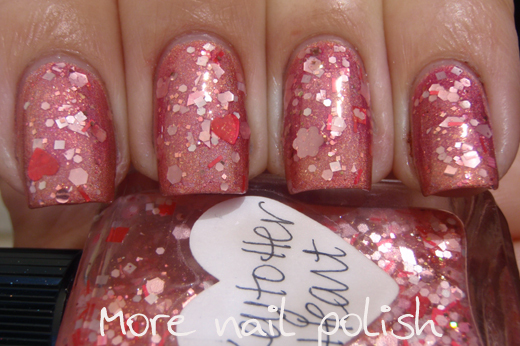 There is so much glitter in the bottle that you can't really see what is there until you put it on the nail. Here I am wearing one coat of Key to Her Heart over China Glaze BFF. Although the base polish is a holo, I expected the holo to be dulled by the glitter polish on top, but it really was an excellent match to the bottles base colour. I used two layers of Seche Vite to smooth it out. Glitter payoff was great and I didn't have to fish out the special glitters. There were also no curling or taco glitters at all. 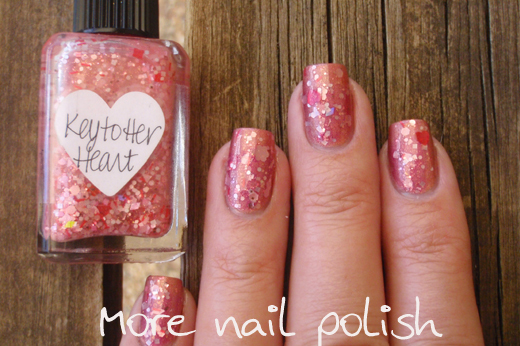 I originally wore two coats of Key to Her Heart on it's own, and while I really liked the density of the glitter, the base was too sheer for my linking and showed my slightly yellow tinted nails a bit too much! Lynnderella polishes are available from her ebay store. Buy it now listings for all the regular polishes appear everyday. Love the base you used! oooh la la!! love this!